Love it. Watch it every year and laugh harder each time I watch it. Best movie ever made. It gets funnier every time you watch it. Best Christmas movie ever. We watch it every year. My favourite all time movie ever. Watch it every Christmas and laugh so hard every time. Chevy Chase at his best. Clark Griswold and Cousin Eddie - the best Christmas comedy duo ever! A must see Christmas feel good factor film! 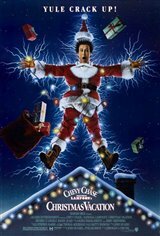 A must-see movie for the Griswold in all of us!